Want your picky-eater kid to try something new? Wait until Halloween, dress it up a little and give it a gross name. 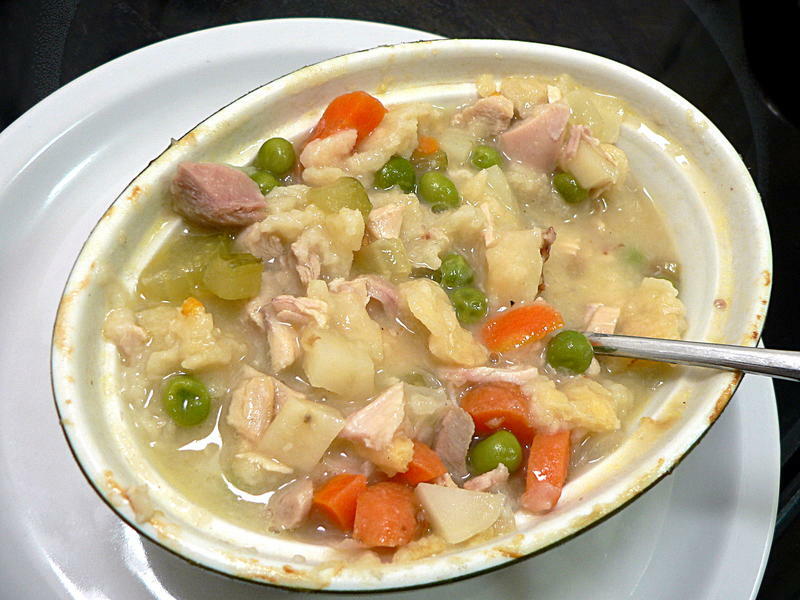 Like turning a classic comfort food recipe – chicken pot pie – into Mummy Stew. marjoram, parsley, oregano, thyme, etc. 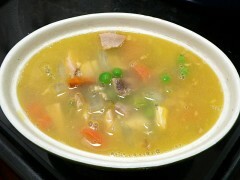 This is a combination of two previous recipes, the chicken rice soup recipe and the basic pie crust recipe. Click those links to see the full recipes. The first one includes making your own chicken broth from scratch. You could buy a box and use that, but once you’ve picked all the meat off the chicken you really don’t have much work left. 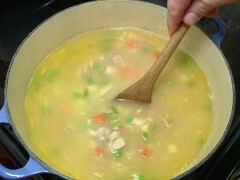 Follow that recipe up to the point where you added the broth to the chicken and vegetables. 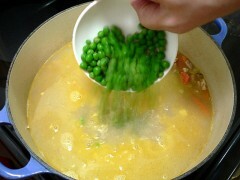 Then, instead of adding rice, add the peas and potatoes and give it a quick stir. While that simmers, follow the second recipe to make the pie crust, except leaving out the sugar. Roll it out, then cut out a piece the shape of your bowls. Those little oval crocks I have gave me the idea for the mummy. 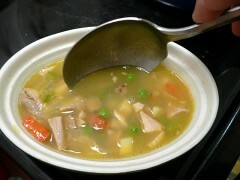 Check local garage sales and thrift shops for interesting bowls to use for things like this. Roll the piece you’ve cut a little bigger so it fits over the edge of your bowl. 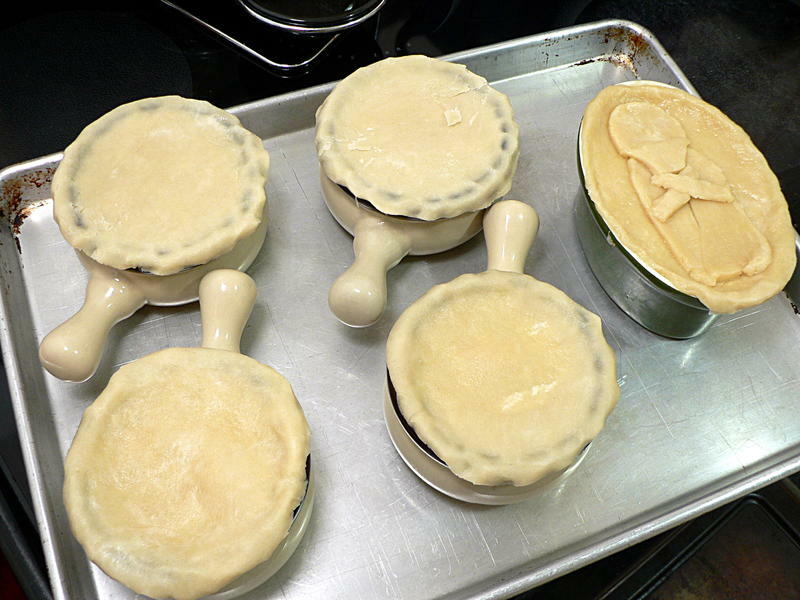 Cut out whatever pattern you want on top and add it to your pre-cut lid. 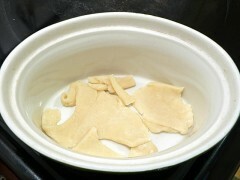 After making lids for all your bowls, take the trimmings that are left and distribute them among the empty bowls. 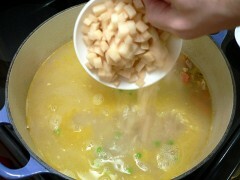 These bits will cook up into mini dumplings, and thicken up the broth a little. 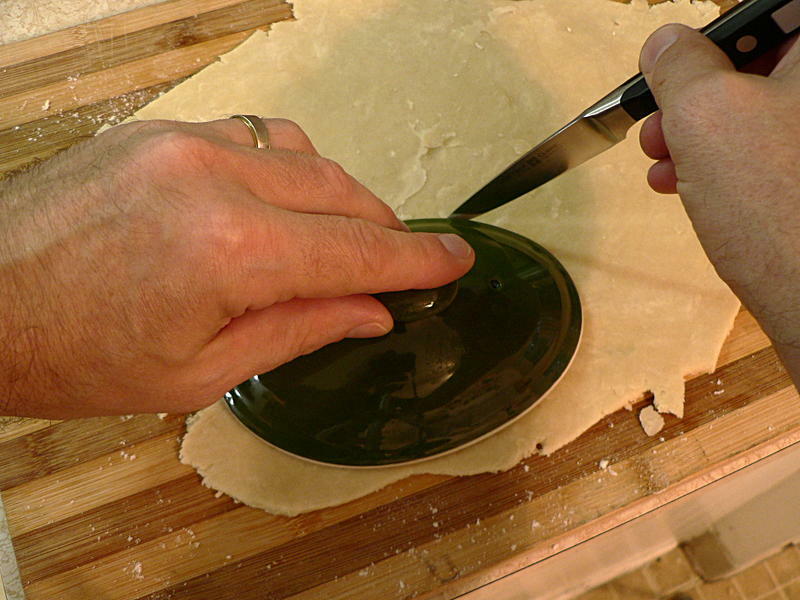 … then add a lid and pinch it to the rim all the way around. Put all the bowls on a baking sheet and put in a 350° oven for about 45 minutes. 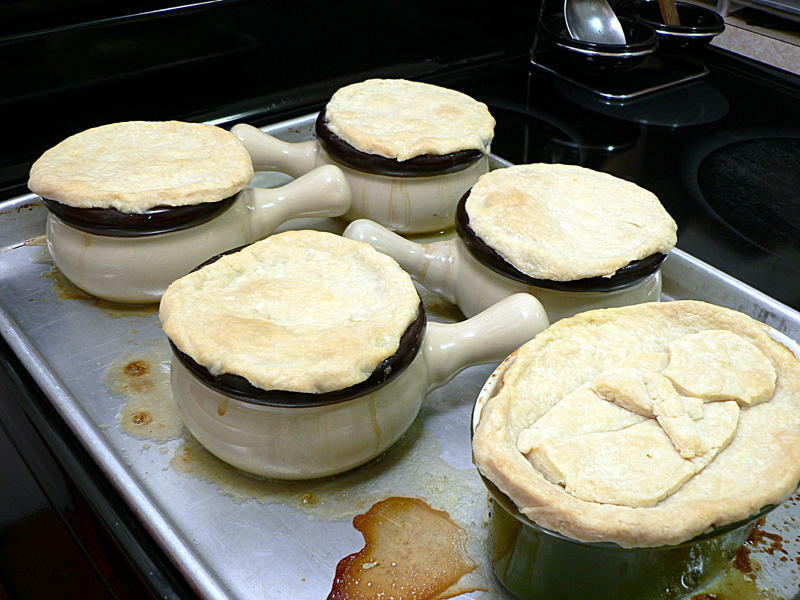 They’re done when the crust is golden brown. 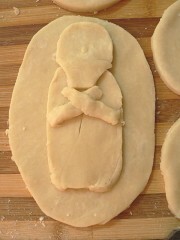 You could go really crazy decorating the top; I stuck to a more subtle look this time. 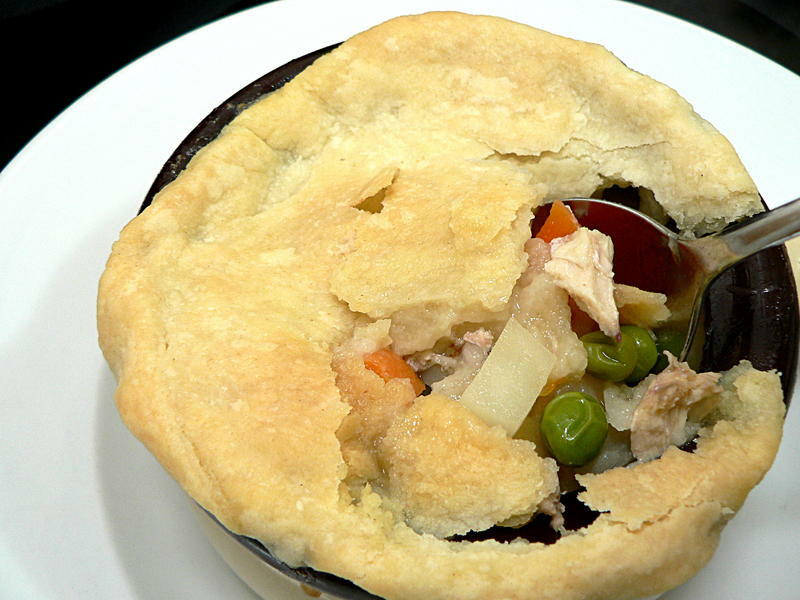 Some pot pie recipes call for cooking the soup with flour to thicken it before baking. This version, the soup is still more like soup, though the potatoes do thicken it a little bit. 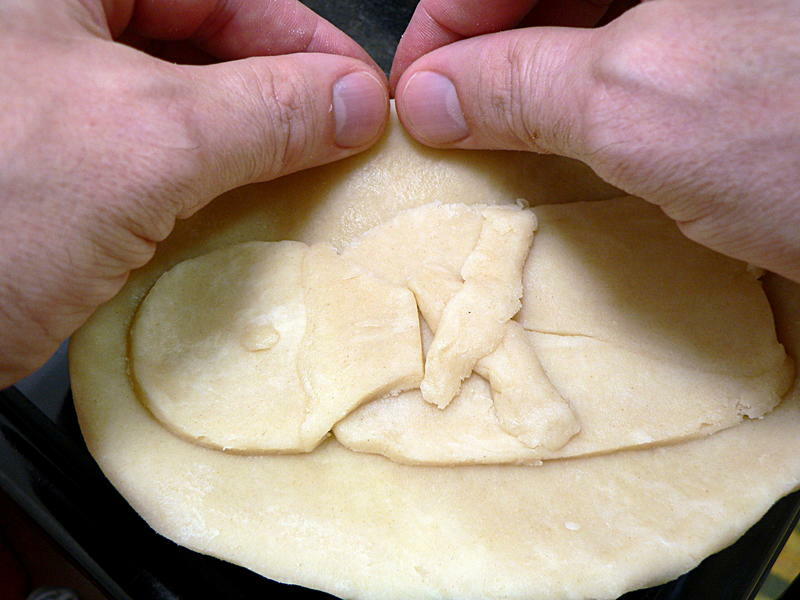 But once you break up the crust and mix it in – you do break up your crust and mix it in, don’t you? – it’s plenty thick enough. 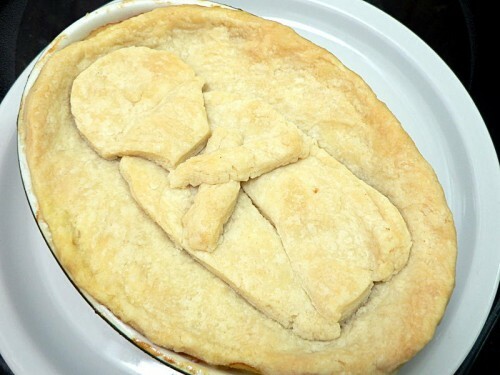 PS: I thought about calling this “Chicken Sarcophagus Pie”, but if you have to explain to a kid what a sarcophagus is, you probably already blew it. What do you think? Tell me in the comments. PPS: A note about ingredients. 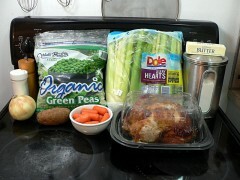 You might have noticed in that picture up top that I had ginormous bags of peas and celery. 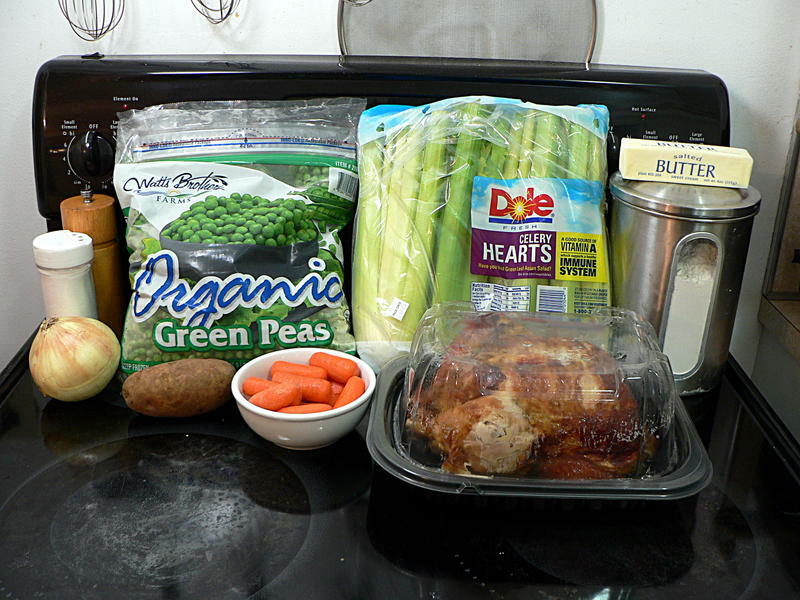 That’s what they carry at Costco, where they also have my favorite rotisserie chickens.